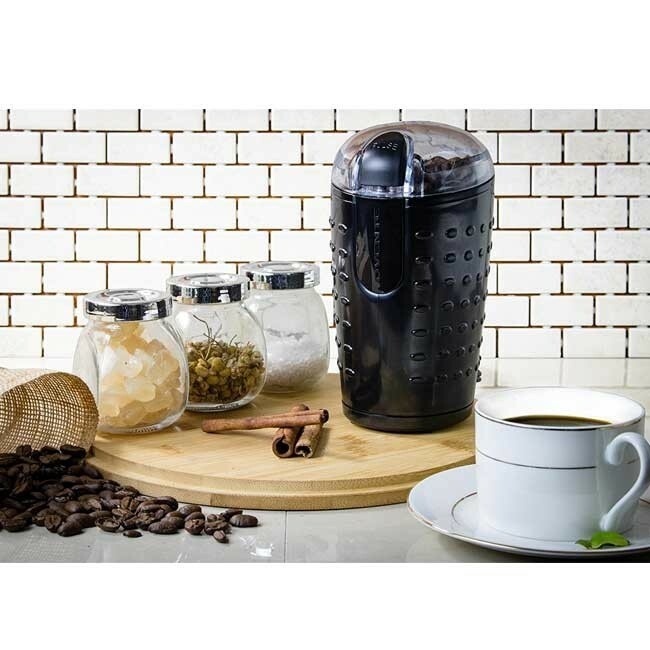 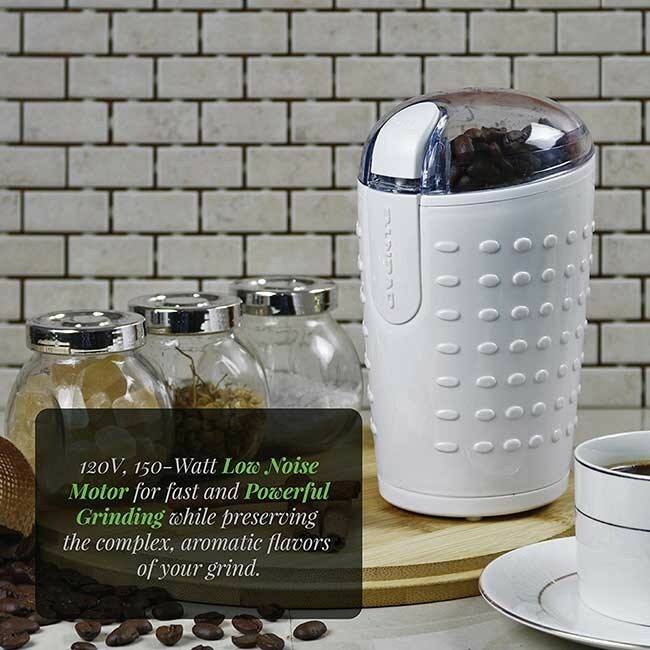 EFFICIENT – Powered by 120V and 150-Watt motor, it grinds fast while preserving aromatic flavors from coffee beans, herbs, spices, grains, etc. 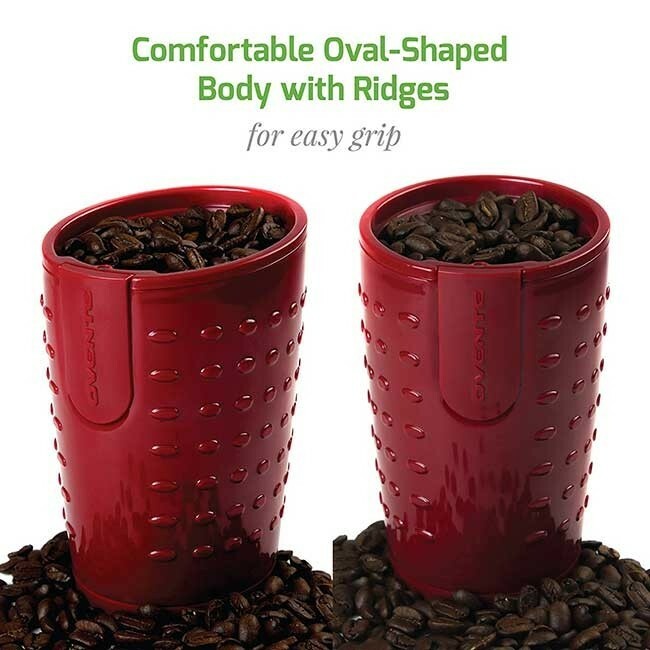 It can hold up to 2.5 oz (70g). 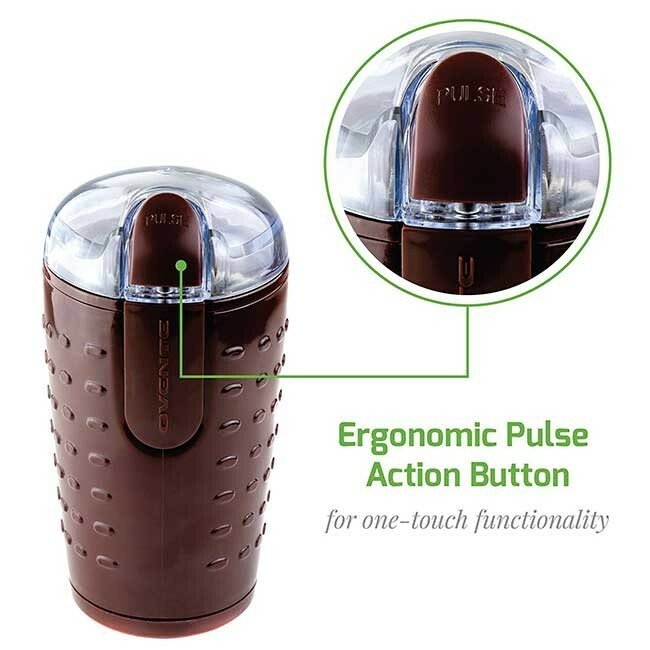 STYLISH & PRACTICAL– Its stylish, ergonomic EasyGrip body and pulse button was designed for your comfort. 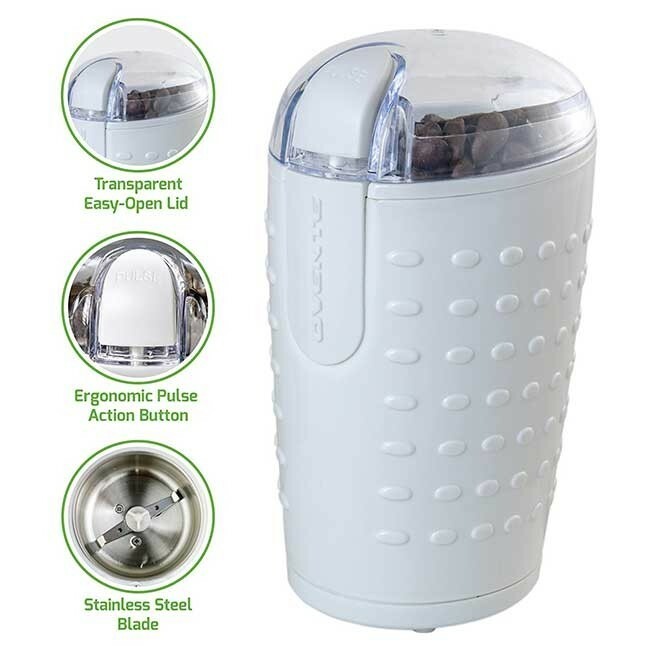 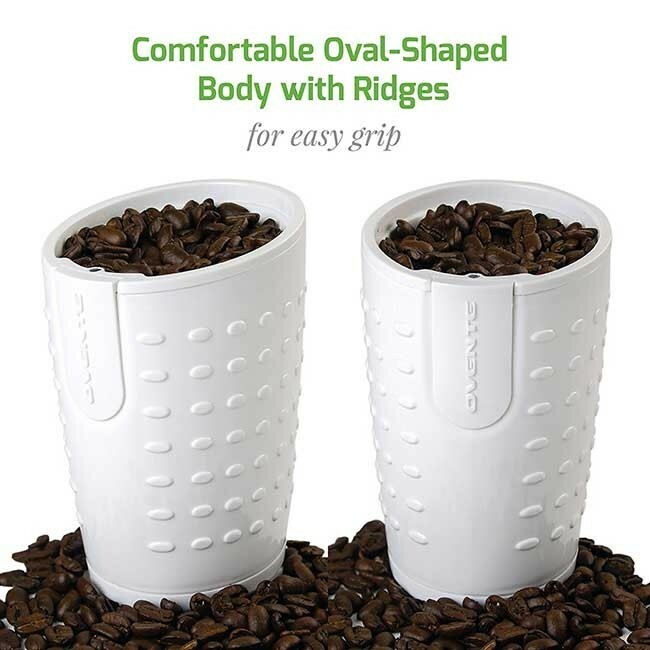 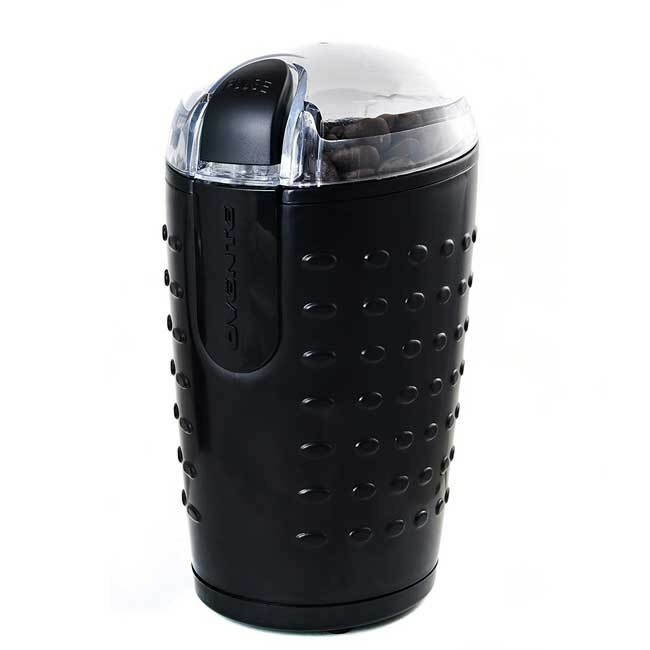 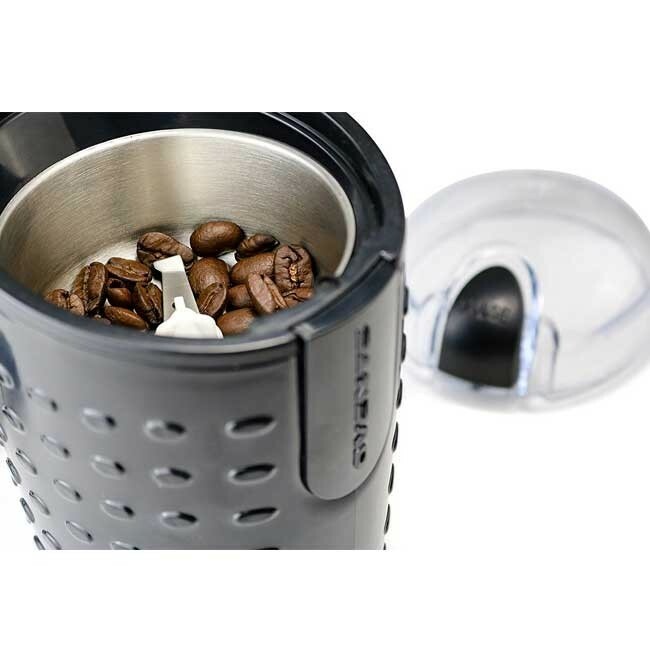 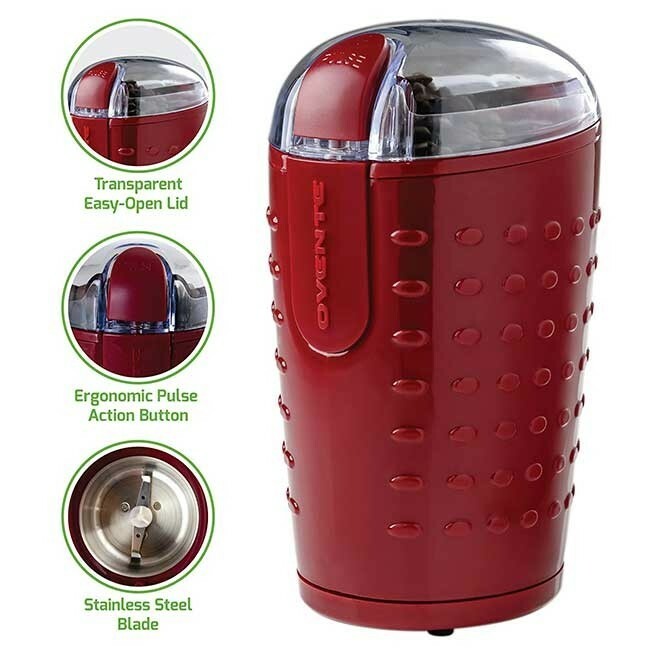 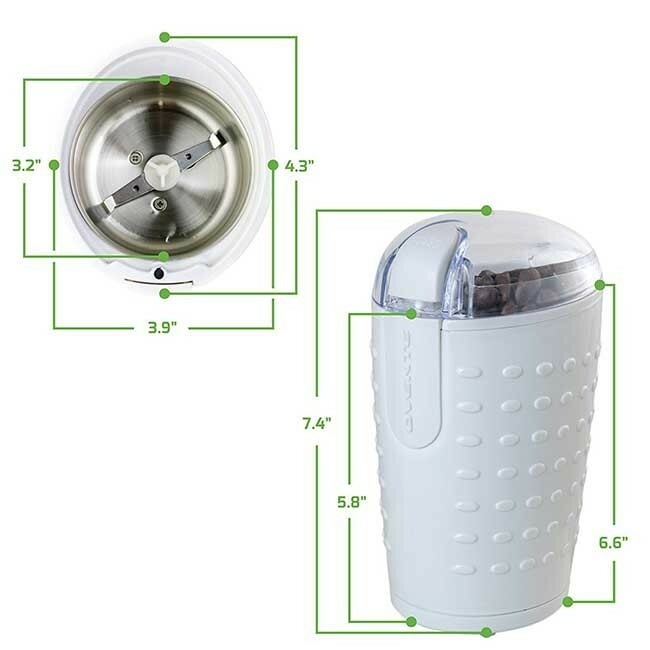 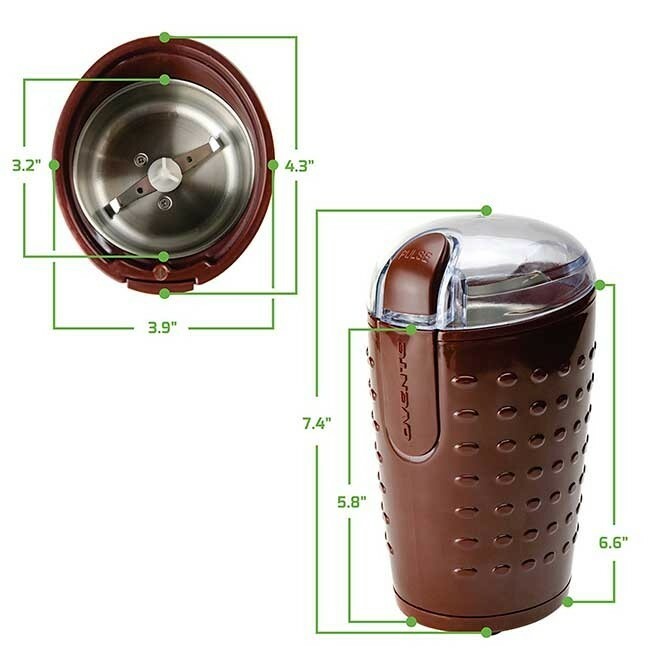 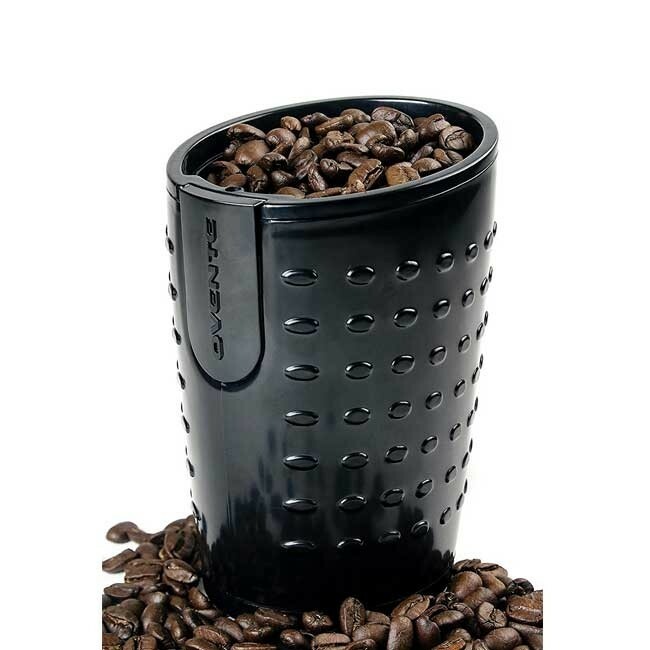 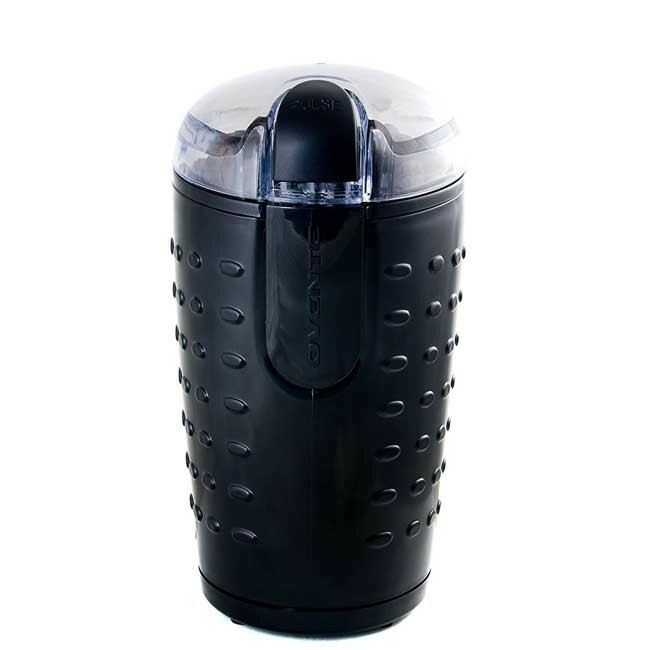 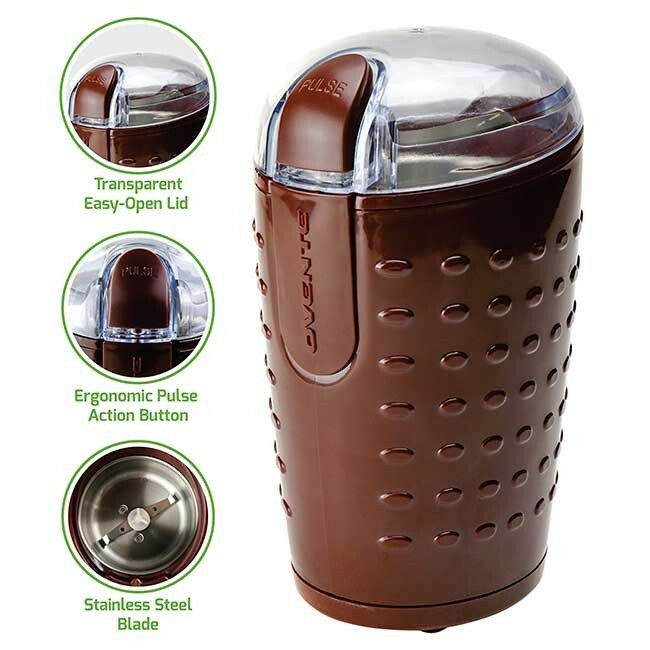 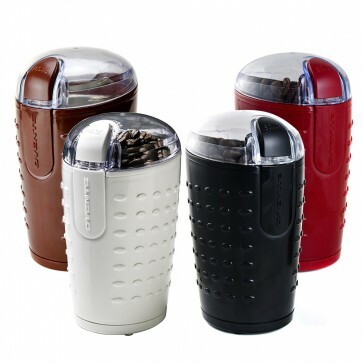 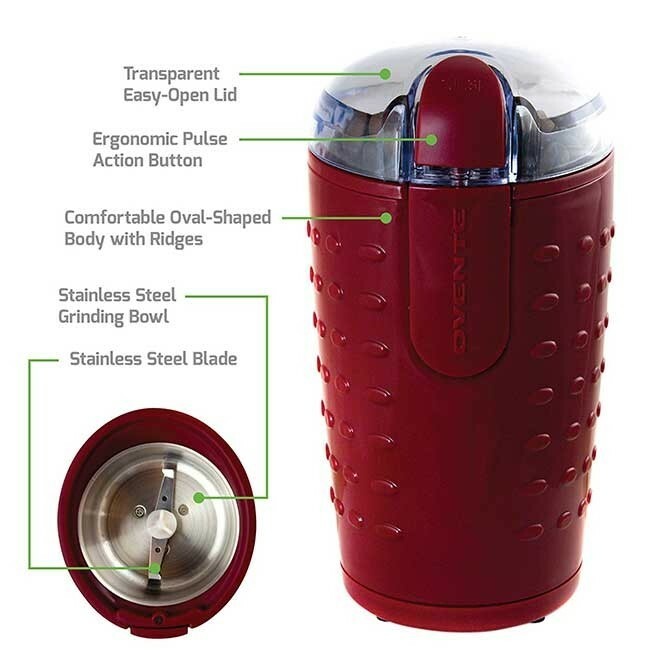 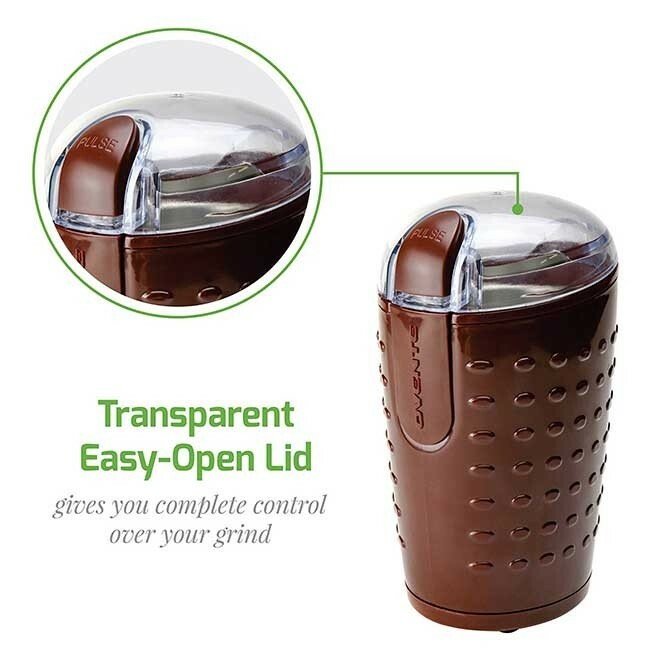 Its transparent, easy-to-open lid with safety lock allows you to check your grind’s texture anytime. 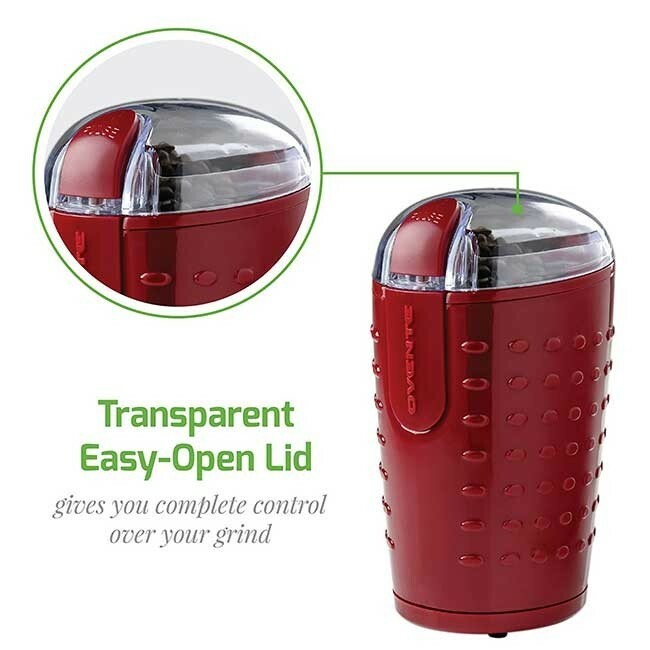 Also includes a built-in cord storage. 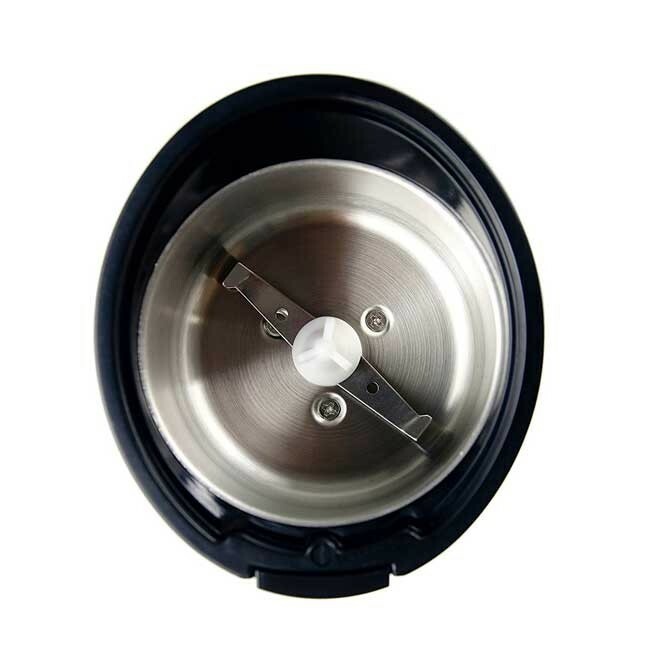 PRECISE– Its grinding bowl and sharp blades are both made of high-quality stainless steel. 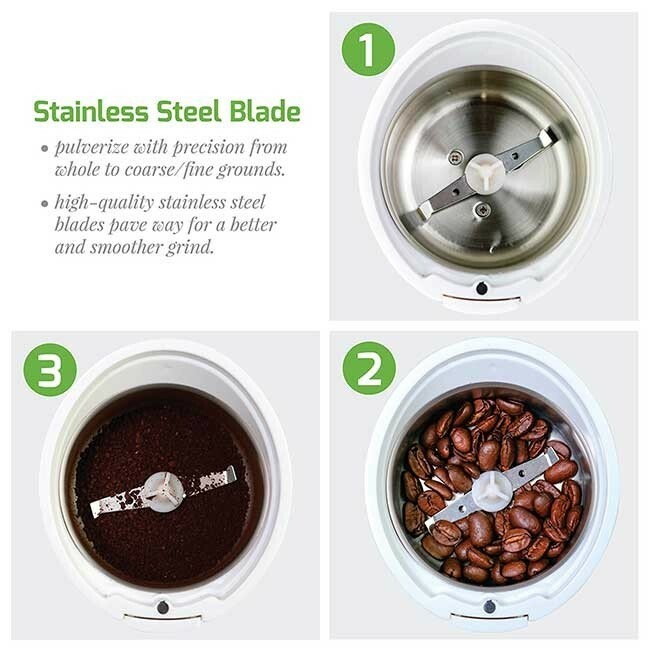 The blades pulverize with precision from whole to coarse or fine in seconds, depending on how long you press “pulse”. 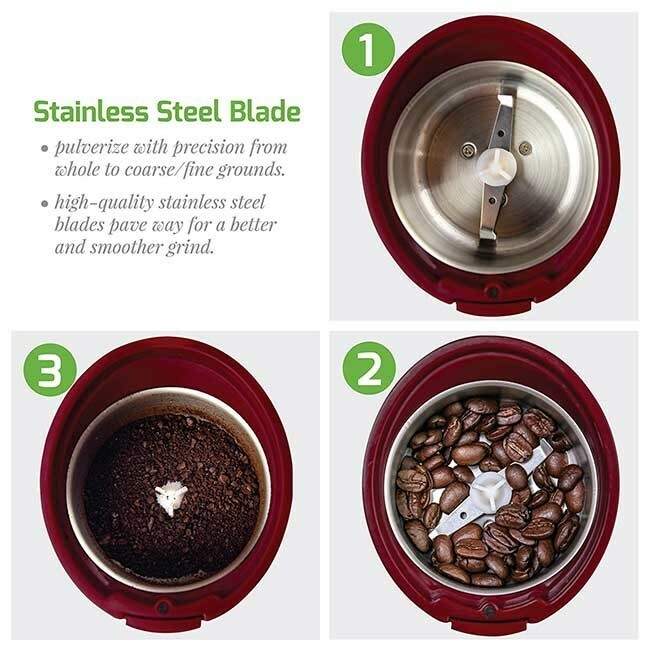 VERSATILE – With this handy tool, you’re not limited to grinding just coffee beans. 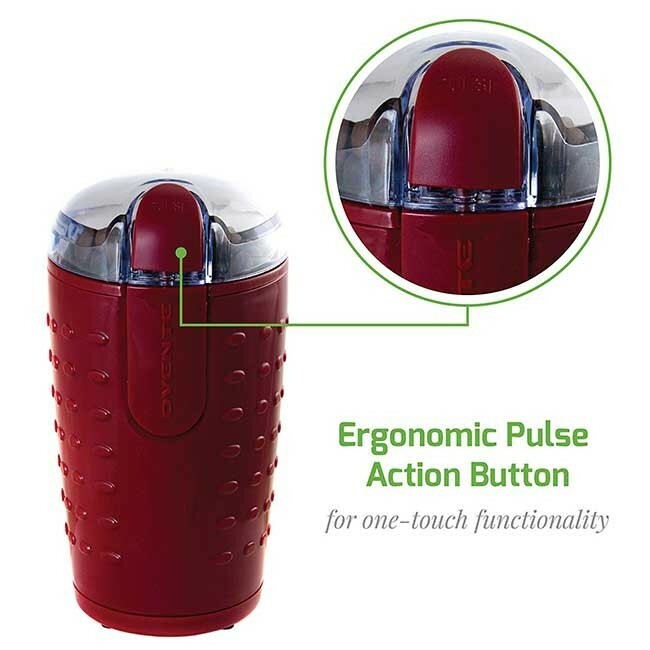 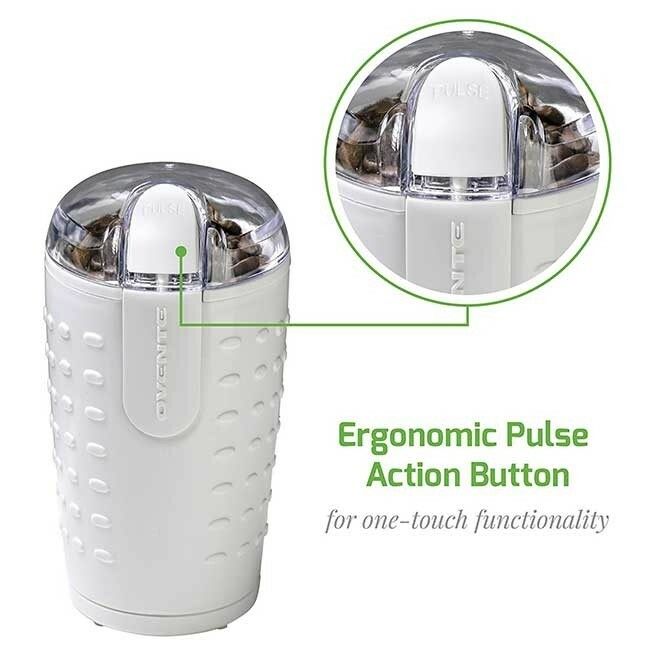 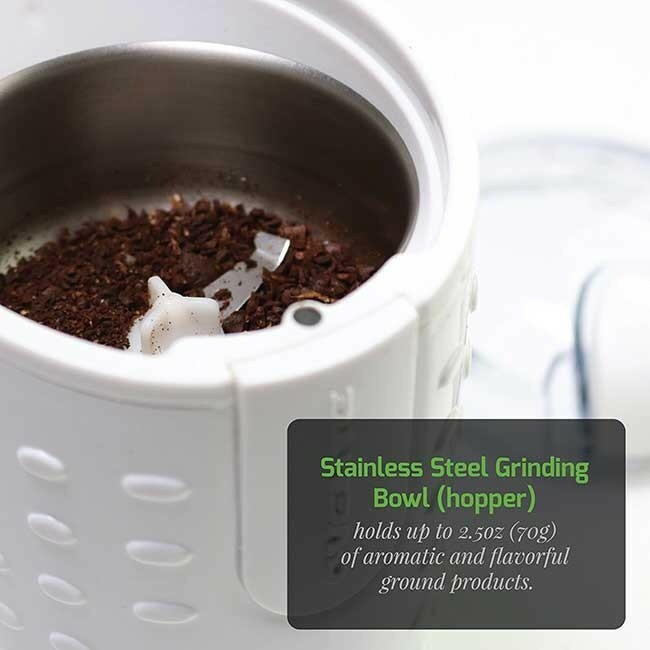 You can grind tea leaves, herbs, spices, nuts, grains, and much more with just one touch! 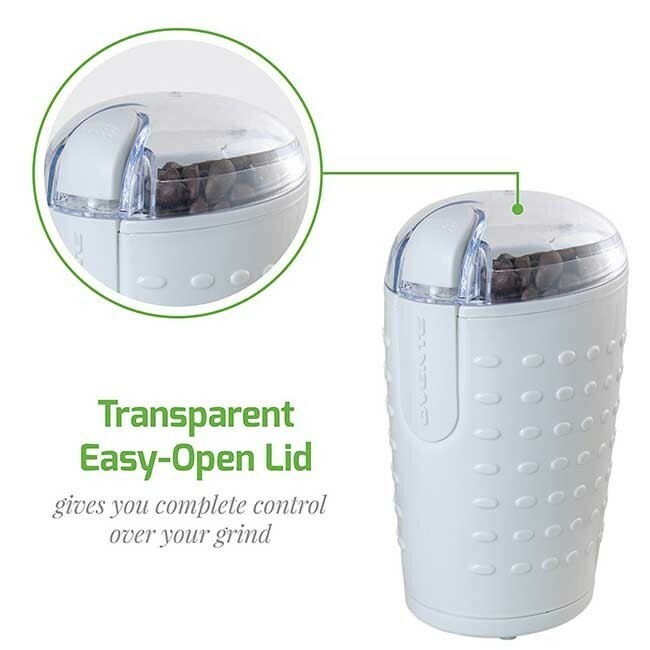 SATISFACTION GUARANTEED – Comes with Ovente’s 1-YEAR LIMITED WARRANTY, so snag your grinder today while supplies last, RISK-FREE! 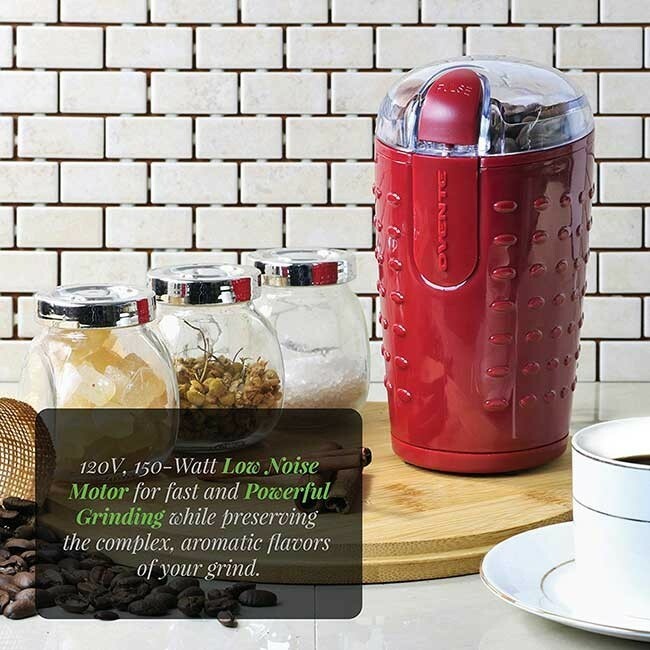 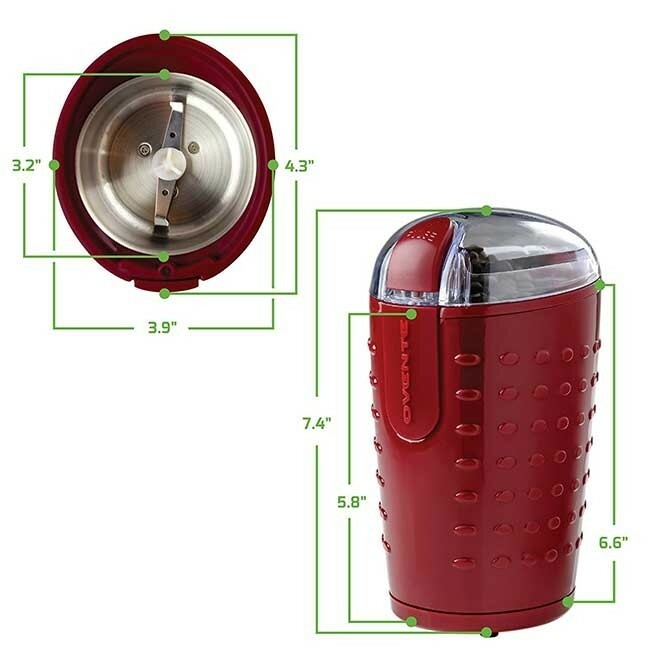 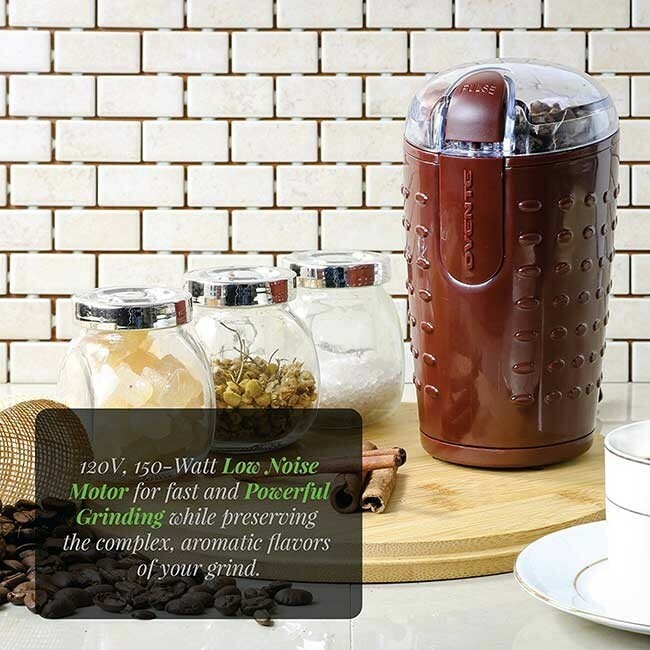 • 120V, 150-Watt low-noise motor for fast and powerful grinding while preserving the complex, aromatic flavors of your grind. 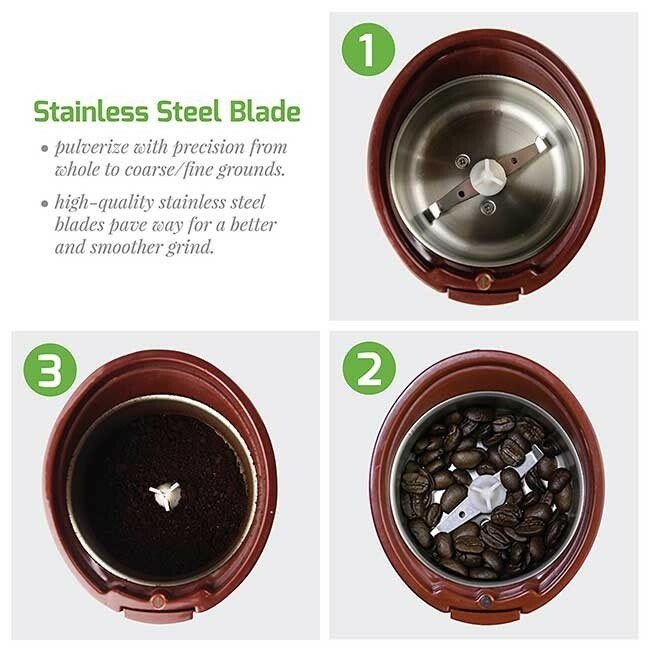 • Stainless steel blades pulverize with precision from whole to coarse/fine grounds. 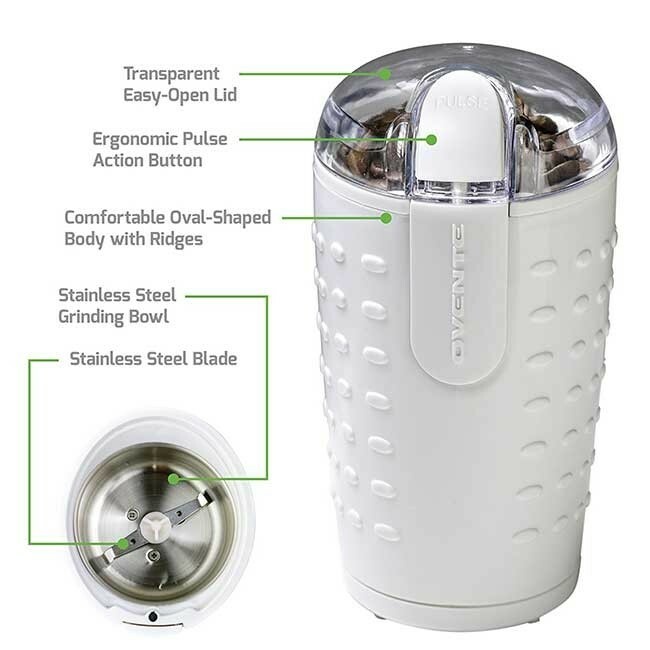 The Ovente Electric Grinder reinvigorates luscious flavors and aroma from ground coffee, tea leaves, herbs, spices, nuts, grains and so much more. 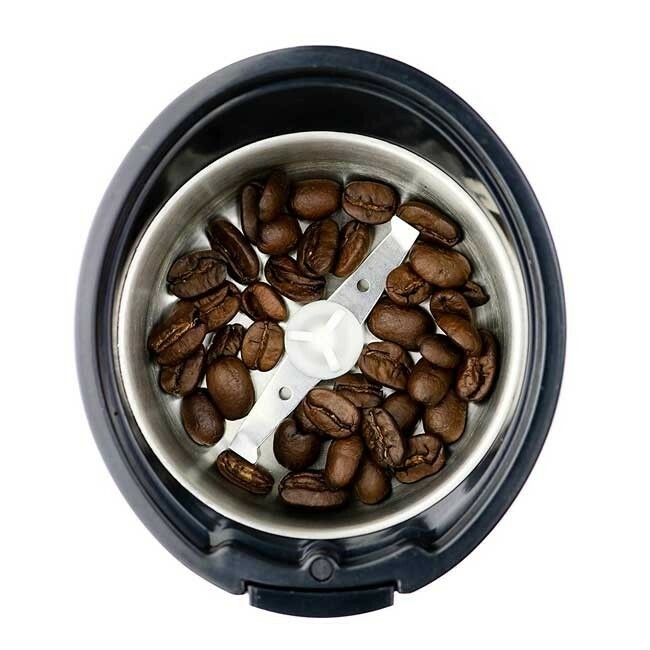 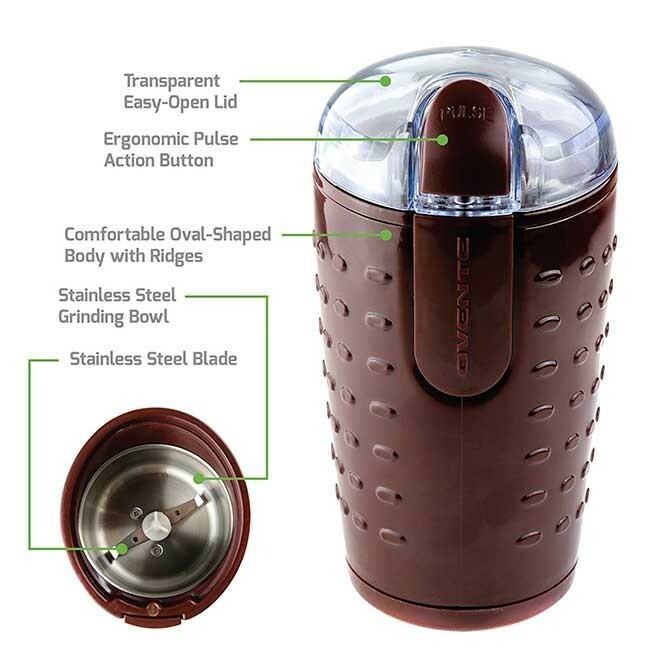 Equipped with 150-Watt motor power, the Ovente Electric Grinder can pulverize and grind whole coffee beans into a freshly-ground powder within seconds. 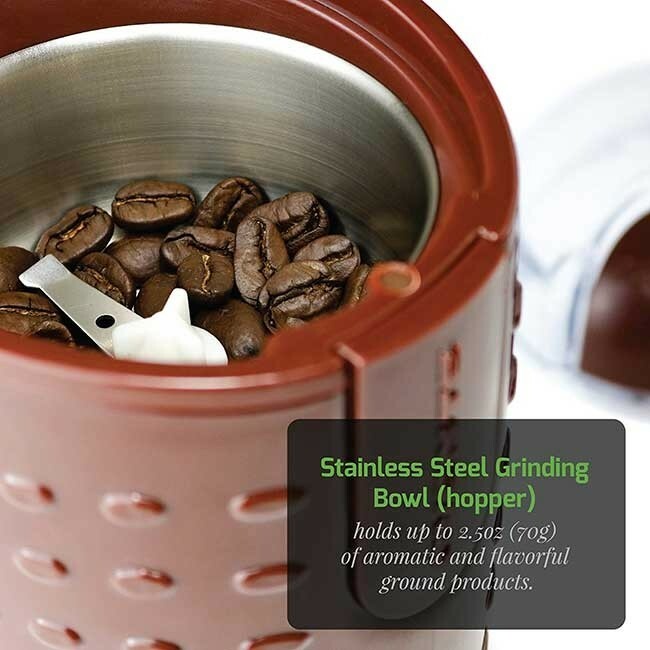 The high-quality stainless steel blades pave way for a better and smoother grind. 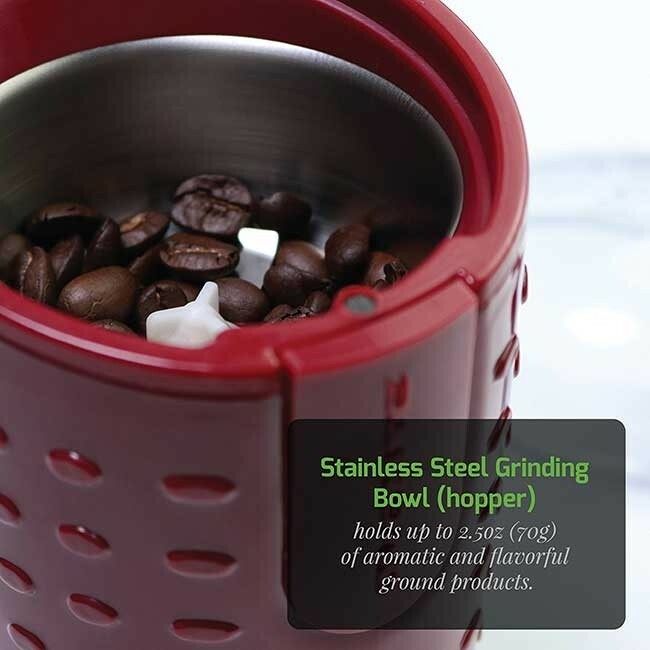 Its stainless steel grinding bowl (hopper) holds up to 2.5oz (70g) of aromatic and flavorful ground products. 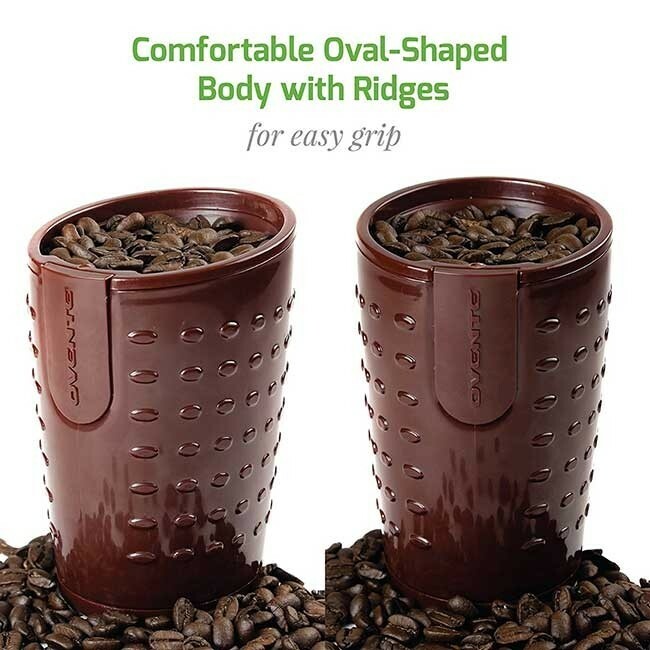 The ergonomic oval structure of the body was carefully designed for easy gripping, making accidental slips a thing of the past.